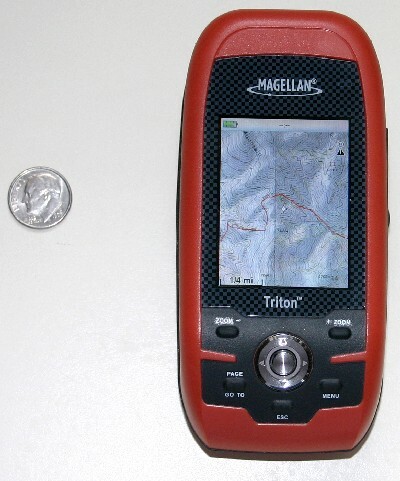 The Magellan Triton 500 GPS isn't groundbreaking in terms of technology, utility, size, price or even its feature set. It's not miraculously small, incredibly light, extremely bright nor better than everything else at locating satellites. It's not even the best GPS available for motorcyclists. It's already being discounted by many retailers, apparently because of early firmware issues that Magellan seems unwilling to acknowledge or address very fast. So why did we acquire one - aside from finding it under the xmas tree? Well if you use National Geographic's popular TOPO! software this receiver happens to be the easiest way to get your maps and routes out of your computer and into the field on a hand held GPS unit. Though it may not be the best at anything else, compatibility with TOPO! and journeyman level competence in all other aspects make this an appealing GPS unit for a lot of motorcyclists - especially off road enthusiasts. 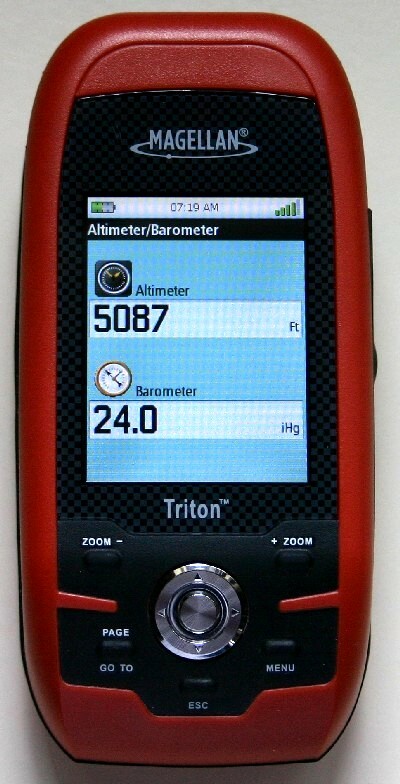 The Triton 500 features a 3-axis electronic compass that works without moving the unit, a very sensitive barometer, a bright, full-color QVGA (240 x 320) 2.2" display, and a SD card slot. The Triton 500 measures 4.65" x 2.16" x 1.22", weighs 6.6 oz with the battery and is encased in rubber armored impact-resistant plastic that is water resistant to the IPX7 standard - which means that the case should withstand immersion up to a depth of 1 meter for a half-hour. It's plenty sturdy enough to take the type of pounding it's likely to receive even on a dirt bike. 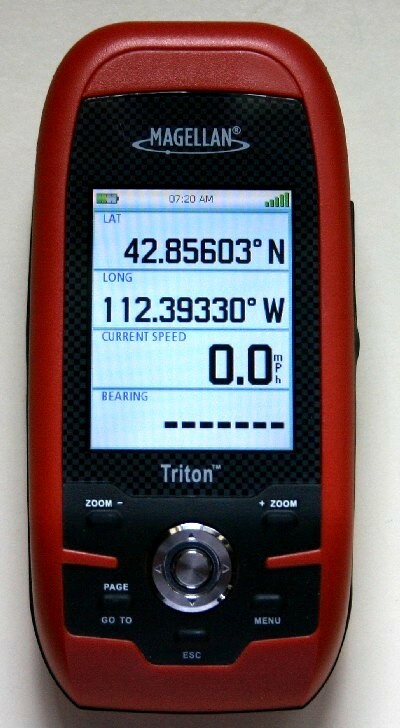 The Triton 500 comes pre-loaded with base maps of the contiguous U.S., Alaska, and Canada. The internal memory isn't incredibly large but with the SD card you can really load the unit up - we were able to get the entire Tour of Idaho (T2) into our Unit at 7.5 minute quad resolution! That is impressive. The color display is bright and easy to read in all but the strongest sunlight. The preloaded base maps are less than great but this should be easy to rectify with Magellan Mapsend. We've read complaints elsewhere concerning the buttons - specifically having to push them more than once to get them to work. We have experienced no such issue with our unit. We are particularly pleased with the "PAGE" button function which rapidly scrolls between the various screens shown in the accompanying photographs. The file system on the Triton 500 isn't like that of any Magellan unit we've used before and will likely frustrate experienced GPS users. The Triton 500 requires menu surfing to manipulate the file structure and reminds me somewhat of migrating from DOS command line prompts to the first GUI's. The menus are useful for GPS newbies but completely non-intuitive to everyone else. This experience is mirrored in getting the Triton to communicate with the TOPO! software on a computer which must be initiated from the TOPO! software via an add-on. The only thing that makes any of this tolerable is how much better the Triton is compared to previous Magellan units that were also supposed to work with TOPO!. So is the Triton 500 the best thing since sliced whole wheat bread? Not hardly. But it is the best Magellan unit yet for use with TOPO! If that's your bag the Triton 500 is worth a look. We'd like to see longer battery life (7 hours max) a bigger screen, a better file and menu system and better base maps. It could be a little more rugged too. The batteries in the back of our unit will sometimes rattle loose in rough terrain resulting in a false low battery condition that sometimes even shuts the unit down. We fixed this with a little tape, but we shouldn't have had too. Our unit's puny base map was corrupted by a firmware upgrade that required sending the entire unit back to Magellan (we paid shipping) to have it replaced. The return unit wouldn't work with TOPO! without further upgrades and patches that required two days of surfing the web to acquire. Both Magellan and National Geographic's customer support occupies the next level below godawful - though you can at least contact Magellan by phone and they do answer email promptly. We are still waiting to hear from National Geographic. Even though the functioning Triton works well, the complete lack of customer support forces us to issue a caveat about dealing with either company. Once the unit works it's pretty nice, but the road to success is long and winding and you get there on your own. We acquired a car power adapter and RAM mount for this unit and now run it off the 12-volt power adapters we have on our bikes - eliminating the issues with battery life.